The law firm of Snyder & Snyder, P.A. was founded in 1973 by William "Bill" Snyder. In the late 80's, Bill began limiting the firm's focus exclusively to estate planning and estate administration cases. Since that time, the firm has evolved into a boutique estate planning and estate administration firm with attorneys and a complete support staff that provide excellent estate planning and estate administration services. Unlike many large firms, the firm of Snyder & Snyder, P.A. strives to provide a relaxed, caring, customer-centered experience for all of their clients. An example of this commitment is the ability to reach any attorney or other team member directly at his or her desk without having to first speak with a receptionist or secretary. The firm prides itself on providing small firm style, service and relationships, combined with large firm capabilities and resources. The firm of Snyder & Snyder, P.A. 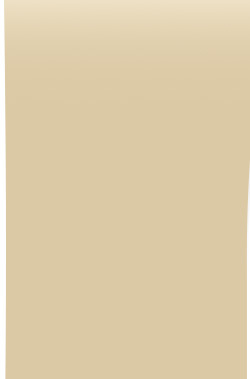 receives numerous accolades each year for the quality of its service and the ethics of its team members. Bill Snyder was recognized in Florida Trend’s Florida Legal Elite™ in 2011 and 2012 as among the best in the state. 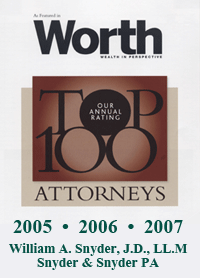 In addition, Bill was recognized by Worth Magazine for three consecutive years as one of the “Top 100 Attorneys” in the United States, has been listed in Florida SuperLawyers® magazine for the last ten years, and has been chosen by his peers to be included in the last ten consecutive editions of The Best Lawyers in America® in the specialties of Trusts and Estates. In November 2009, Bill was awarded the Key Partners Award in Trusts and Estates by the South Florida Business Journal, and in 2011, Bill was elected as a Fellow in the American College of Trust and Estate Counsel (ACTEC). Additionally, the firm is listed by Martindale-Hubbell Legal Directories as an "AV" rated firm which signifies that it is rated in the top 10% of firms by its peers.